The Young and the Restless (YR) Spoilers: Ashley’s Emotional Exit – What Happens To Abbott Family Now? Major drama is hitting a legacy clan on ‘The Young and the Restless’. So what happens to the Abbott family now? If Y&R is actually opting to write-out Ashley (Eileen Davidson) indefinitely and no recast is coming, then the Abbott story could shift, generationally, to a Jack (Peter Bergman) verses Billy (Jason Thompson) battle. That direction would supplant Bergman’s character sparring with the character Davidson has played, off and on, since the mid-1980’s. Younger family members, meaning Kyle (Michael Mealor) and Abby (Melissa Ordway) have already been linked by their new significant others. Kyle will surely come into, or create conflict with his cousin now that Lola (Sasha Calle), Arturo’s (Jason Canela) sister, has become part of his life. Since Abby is at Dark Horse and Kyle is perched at Jabot, there appears to be no business-based issue brewing, at least for the moment. 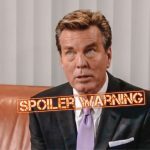 Jack (Peter Bergman) said he doesn’t want to be back at Jabot, but is Traci (Beth Maitland) staying? If that proves true, then Maitland’s character would have to remain in town and become a fixture within the family business. Despite the removal of the blood-Abbott clause, Y&R isn’t going to allow a non-Abbott run things from here on out, right? Billy actually showed a lot of promise when he sat in the Chief Executive Officer’s chair. The younger Abbott seems inclined to continue working at his father’s cosmetics company. Kerry Jones (Alice Hunter) will arrive this month and become Jabot’s new chemist. Billy’s just become single, has often combined work and personal matters, and wouldn’t mind further provoking Phyllis (Gina Tognoni) and Summer (Hunter King). Will Dina (Marla Adams) remain a vital part of the storyline, as this character’s function appears to be playing out? Hopefully not. The injection of meaningful, topical storylines into soap operas has long been practiced in daytime. Dina’s Alzheimer’s condition and all that’s been seen through it, has created many great dramatic moments and superb performances, most especially those delivered by Adams. Fans of ‘The Young and the Restless’ rightfully express their opinions on a regular basis. So, what happens to the Abbott family now? General Hospital Spoilers: Stella Henry In Danger – Ryan Chamberlain’s Next Victim?